In December of 2018 the unemployment rate for the State of Michigan was 4.1, an increase from the November unemployment rate of 3.4, according to the most recent data provided by the Michigan Department of Technology, Management and Budget. The State unemployment rate for December of 2017 was 0.6 points below what it was in December of 2018 (4.7). Since April of 2018 the data shows that the unemployment rate for the State essentially leveled out around 4, except when it dropped to 3.4 in November. The Detroit rate was 0.5 points higher in December of 2018 from the previous month. Also, the December 2018 unemployment rate for Detroit was 0.1 points lower than what it was in December of 2017. The chart above displays the unemployment rates for each of the seven counties in Southeastern Michigan for December of 2017 and 2018. In December of 2018 Wayne County had the highest unemployment rate at 4.9, with St. Clair County having the second highest regional unemployment rate 4.7. Livingston, Oakland and Washtenaw counties were the only three in the region with unemployment rates below 4 in December of 2018. The unemployment rate for Livingston County was 3.3, the unemployment rate for Oakland County was 3.3 and the unemployment rate for Washtenaw County was 3.1. When comparing 2017 and 2018, Monroe, Washtenaw and Wayne counties were the only three in the region to experience a decrease in unemployment. 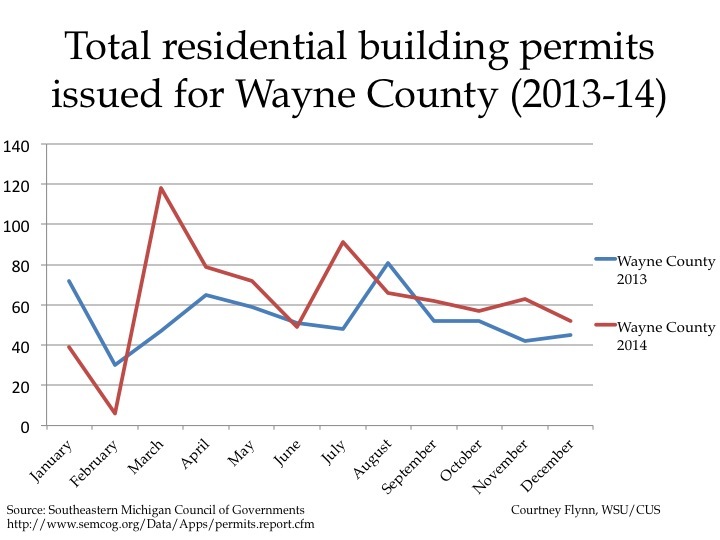 Wayne County had the largest decrease at 0.9 points. Livingston, Macomb and St. Clair counties all experienced an increase from 2017 to 2019. Livingston County had the largest increase at 0.2. According to the index, the average price of single-family dwellings sold in Metro Detroit was $123,550 in December 2018; this was $490 lower than the average family dwelling price in November. The December 2018 price was an increase of $6,210 from December of 2017 and an increase of $13,430 from December of 2016, an increase of $19,780 from December of 2016 and increase of $26,570 from December of 2014. In April of 2018 the unemployment rate for the State of Michigan was 4, a decrease from the March unemployment rate of 4.6, according to the most recent data provided by the Michigan Department of Technology, Management and Budget. The State unemployment rate for April was 0.3 point above what it was in April of 2017. The Detroit rate was 1.3 points lower in April of 2018 than in March. In April of 2018 Detroit’s unemployment rate was reported to be 7.4, this was .3 points higher than in April of 2017. The chart above displays the unemployment rates for each of the seven counties in Southeastern Michigan for April of 2017 and 2018. Monroe County was the only one in the seven county region to have a lower unemployment rate in 2018 than in 2017. In April of 2017 Monroe County’s unemployment rate was 3.7 and in 2018 in dropped slightly to 3.7. In April of 2018 Wayne County had the highest unemployment rate at 4.3, St. Clair County was only slightly below at 4.2. These two counties were the only two in the region to have unemployment rates about 3.5 in April of 2018. Washtenaw County had the lowest unemployment rate in the region at 2.8. Oakland County and Livingston County were the only other two counties in the region with an unemployment rate below 3. While Livingston County had among the lowest unemployment rate in the region in April of 2018 it also had the largest increase in its unemployment rate between April 2017 and April 2018. In April 2017 the unemployment rate for Livingston County was 2.4 and in 2018 it increased to 2.9. According to the index, the average price of single-family dwellings sold in Metro Detroit was $120,020 in March 2018; this was $1,220 higher than the average family dwelling price in February. The March 2018 price was an increase of $16,240 from March of 2016 and an increase of $22,120 from March of 2015 and an increase of $26,240 from March of 2014. The Standard and Poor’s Case-Shiller Home Price Index for the Detroit Metropolitan Statistical Area shows home prices continue to increase monthly and annually. On March 15, 2017 the Federal Reserve Raised the federal interest rate by .25 percent; it now ranges between .75 and 1 percent. This is the third time the rate has been raised since the financial crisis. Prior to last week rates were raised once in 2015 and once in 2016. The rate increase has been attributed to strong job growth, more investment from businesses into operations and a higher rate of consumer spending. This rate increase will impact credit products, such as mortgages and auto loans, in addition to savings, home equity lines of credit and credit cards. 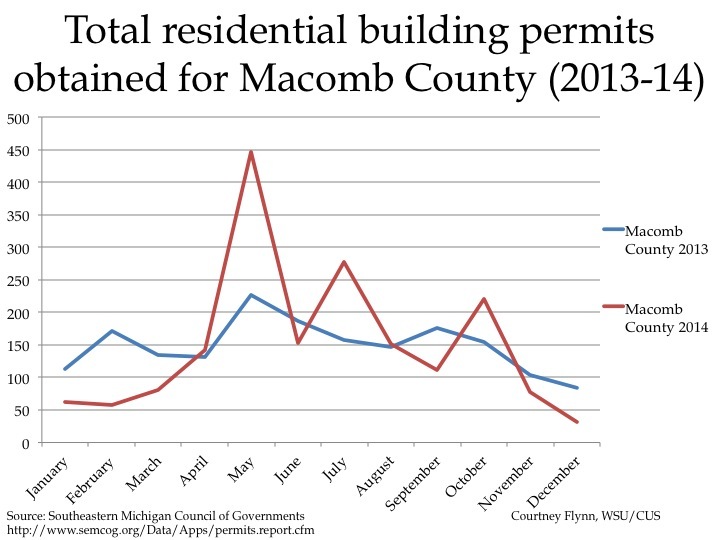 Another item that may be affected is new home starts, a statistic that is not readily available through the Southeastern Michigan Council of Governments website, as it once was. Above are three average 30-year mortgage interest rates at the national, state and local levels. These rates were provided by bankrate.com, which does a national survey of large lenders on a weekly basis. As a 30-year fixed rate mortgage is the most traditional type of home financing this was chosen to show the rate differences. The State of Michigan had the lowest average interest rate for the week of March 16 at 4.14 percent and the national average was the highest of the three at 4.44 percent. Detroit’s average 30-year fixed mortgage interest rate was 4.42 percent, which according to bankrate.com is an increase from the previous week. According to bankrate.com, Detroit’s rate for an average 30-year fixed mortgage rate in the Detroit area is equivalent to about an additional $4.50 a month on a mortgage for $165,000. Such an increase brings the average monthly payment to about $819. According to the index, the average price of single-family dwellings sold in Metro Detroit was $109,790 in October 2016. This was an increase from $6,520 from October of 2015 and an increase from $11,570 from October of 2014. According to the most recent data provided by the Michigan Department of Technology, Management and Budget, the unemployment rate for the State of Michigan slightly increased to 5.2 in January of 2017 from 5 the previous month. Detroit, however, had a big increase. 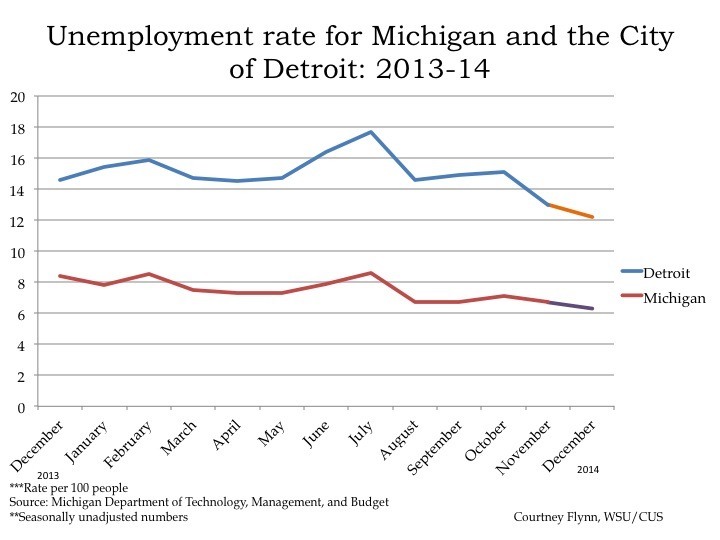 Unemployment in the City of Detroit increased from to 9.8 in December to 12.3 in January. The January unemployment rate for Detroit in 2017 was 1.2 points higher than it was the previous year at that time. The chart above displays the unemployment rates for each of the seven counties in Southeastern Michigan for January of 2016 and 2017. 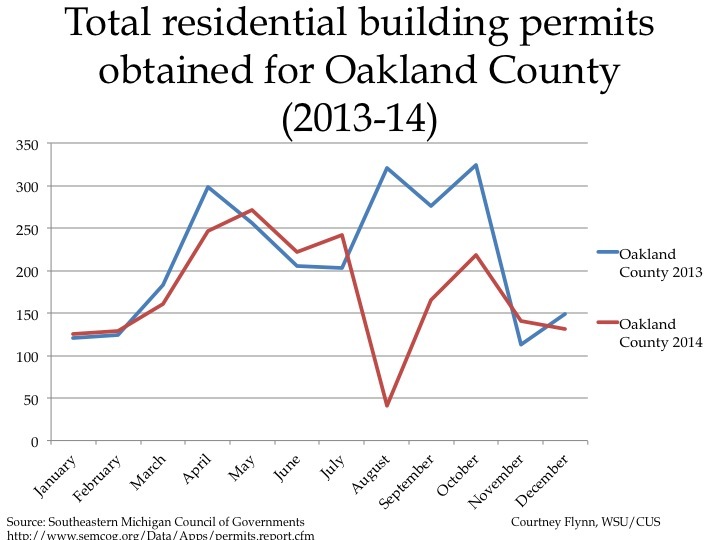 For 2017, St. Clair County had the highest rate at 7.7 while Washtenaw County had the lowest at 3.4. St. Clair and Wayne counties were the only two in the region with unemployment rates above 7 in January. Four of the seven counties (Livingston, Monroe, Oakland and Washtenaw) all had unemployment rates at or below 5. While in 2016 St. Clair County again had the highest unemployment rate for the month of January, regionally, and Washtenaw County had the lowest, it is interesting to note that unemployment rates were higher across all counties in 2017. Wayne County had the largest difference between 2016 and 2017 at 1 point; the unemployment rate was 6.2 in 2016 and 7.2 in 2017. The Purchasing Manger’s Index (PMI) is a composite index derived from five indicators of economic activity: new orders, production, employment, supplier deliveries, and inventories. A PMI above 50 indicates the economy is expanding. According to the most recent data released on Southeast Michigan’s Manager’s Index, the PMI for December 2016 was 53.3, a significant drop from an index of 61.9 the prior month. History shows though that January traditionally has a lower PMI readings and it is expected to increase for February. The January 2017 Commodity Price Index dropped to the lowest it has been since September of 2015. At that time the Commodity Price Index was 41.2 and this most recent reading was 41.7. There is speculation from the Institute of Supply Management-Southeastern Michigan that this drop could reflect policy changes from the new federal administration, especially as gas and oil prices are up. According to the most recent data provided by the Michigan Department of Technology, Management and Budget, the unemployment rate for the State of Michigan slightly increased to 4.7 in October of 2016 from 4.6 the previous month. 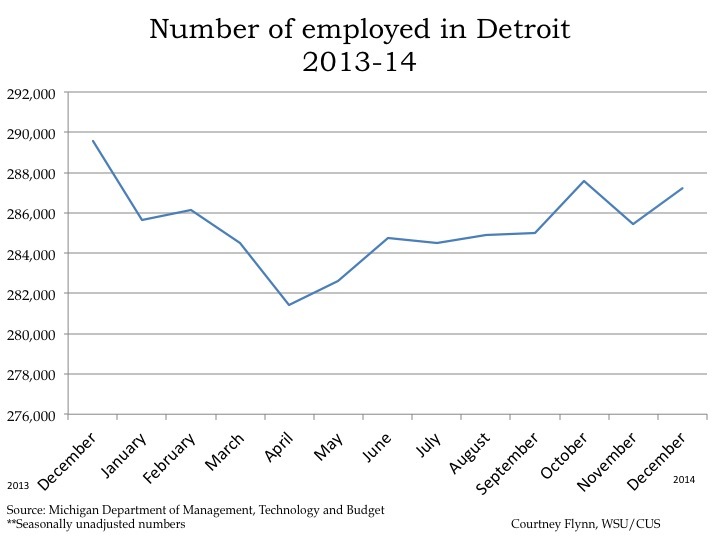 However, unemployment in the City of Detroit decreased to 11.1 in September, from 12.4 the previous month. The September unemployment rate in 2016 was 0.4 points lower than it was in September of 2015. In September of 2016 the number of employed Detroit residents rose to 221,238, an increase of 2,314 from August. Between September of 2016 and September of 2015 there was a total increase of 10,012 employed Detroit residents, according to the Michigan Department of Technology, Management and Budget. While the number of employed Detroit residents increased between August and September the labor force decreased by 1,067. In August the labor force was reported to be 250,047 and in September it was reported to be 248,971. According to the most recent data released on Southeast Michigan’s Manager’s Index, the PMI for October 2016 was 67.2, an increase of 7 points from the prior month. The October 2016 PMI was an increase of 8.4 from the previous year. With this increase, the PMI is considered to be strong, particularly because it has remained above 50 since June of 2014. Much of this growth, according to the Institute of Supply Management of Southeastern Michigan, is due to the resurgence of the auto sector in the region. The October 2016 Commodity Price Index decreased 0.2 points from September but increased 3.2 points from the prior year. 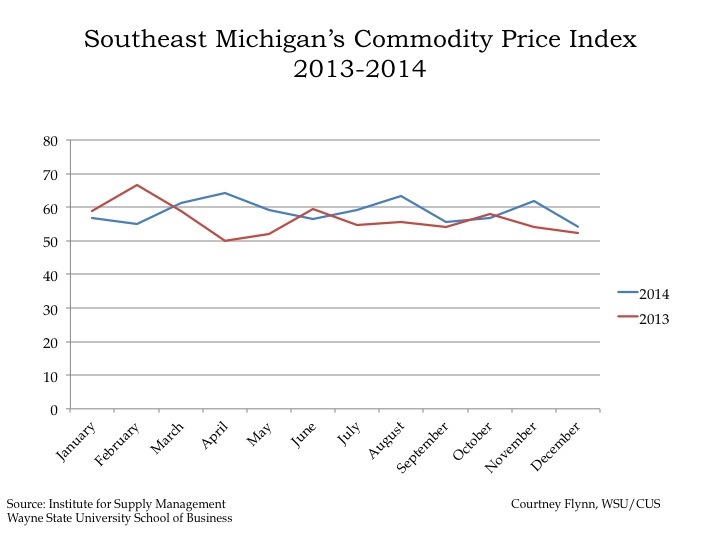 The three month average for the Commodity Price Index was 48, which the Institute of Supply Management of Southeastern Michigan states is good for short-term profits. According to the index, the average price of single-family dwellings sold in Metro Detroit was $109,660 in August 2016. This was an increase from $103,750 from August of 2015 and an increase from $98,720 from August of 2014. Standard and Poor’s Case-Shiller Home Price Index for the Detroit Metropolitan Statistical Area shows home prices continue to gradually increase on a month-to-month basis. According to the most recent data provided by the Michigan Department of Technology, Management and Budget, the unemployment rate for the State of Michigan increased to 4.5 percent in May 2016; the unemployment rate was 4.3 percent in April. During this same period, unemployment in the City of Detroit also increased, but at a higher rate. Detroit’s unemployment increased from 9.1 percent in April to 9.8 percent in May. In May of 2016 the number of employed Detroit residents rose to 218,656, an increase of 1,577 from April. Between May of 2016 and May of 2015 there was a total increase of 8,756 employed Detroit residents, according to the Michigan Department of Technology, Management and Budget. Along with the the number of employed Detroit residents increasing over the last year, so has the labor force. Between April and May of 2016 the labor force increased by 3,784 and between May of 2015 and May 2016 the labor force increased by 803. In May of 2016 the labor force recorded by the the Michigan Department of Technology, Management and Budget for the city of Detroit was 242,432. 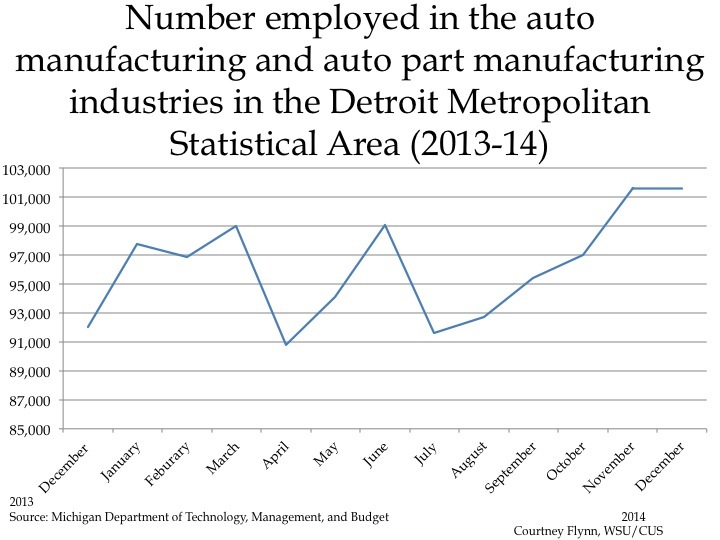 The above chart shows the number of people employed in the auto manufacturing industry in the Detroit Metropolitan Statistical Area (MSA) (Detroit-Warren-Livonia) from May 2015 to May 2016. In that time frame the number of people employed in this industry decreased by 900, from 94,200 to 93,300. 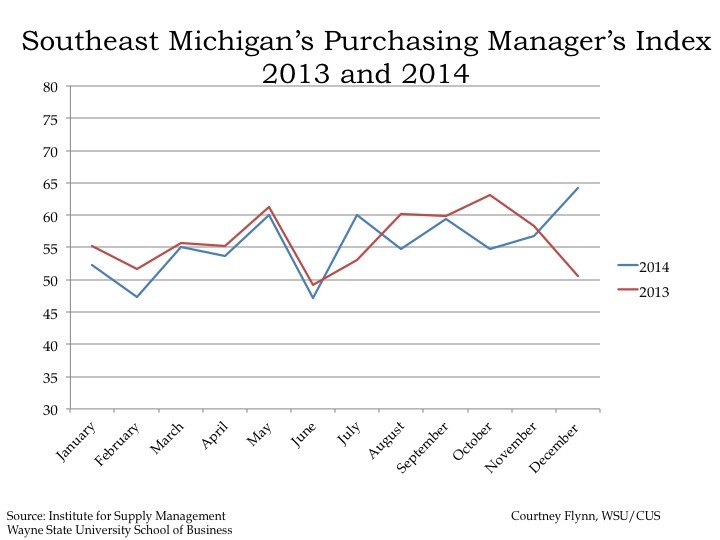 According to the most recent data released on Southeast Michigan’s Manager’s Index, the PMI for June 2016 was 58.8, a decrease of 1.1 points from the prior month. The May 2016 PMI was a decrease of 3.2 from May of 2015. Although there was a decrease, the PMI is still considered strong because of new orders, employment and production. There was a decrease in finished goods, which caused the decrease, along with a decrease in the commodity price index, which is shown below. The June 2016 Commodity Price Index decreased 7.1 points from May and 6.9 points from the prior year. According to the ISM-Southeastern Michigan PMI the Commodity Price decreased between May and June, however fuel, paper and plastics went up in price. According to the index, the average price of single-family dwellings sold in Metro Detroit was $103,780 in March 2016. This was an increase from $97,900 from March of 2015 and an increase from $93,780 from February of 2014. The Southeast Michigan region was the fifth largest export market in the United States in 2013 according to U.S. Census Bureau Statistics, with more than $53.9 billion in exports. In the same year, the state of Michigan reported $58.7 billion in exports, making the region (which includes Lapeer County in the Southeast Michigan) responsible for 91.8 percent of the state’s export economy. This post explores the role of exports in the regional economy and examines how trade connects the region to the world economy. The map above shows the top 25 export recipients receiving goods originating in Michigan in 2014. In 2014, Michigan exports accounted for 3.4 percent of the national export total, by value. Among the top 25 export recipients are countries on six of seven continents. The strongest partnership is with neighboring Canada at more than $25,405 million. Fellow North American Free Trade Agreement (NAFTA) partner Mexico follows Canada, but is well behind at $10,804 million. Export statistics support Michigan’s case as a leader in automotive manufacturing, and this is driven by Detroit. Of the top 25 products being exported, 21 were automotive parts or vehicles; they comprised 45.4 percent of all exports from the state of Michigan in 2014, and grew by 2.9 percent, on average, between 2013 and 2014. Exported products that were not directly related to the automotive industry were aircraft parts, natural gas, iron ore and medicines. These products represented just 6.6 percent of all exports, by value, and saw an average growth of just 2.7 percent from 2013 to 2014. In 2013 Wayne County produced the lion’s share of exports by value in the region ($31 billion), more than double the second-highest exporting county (Oakland at $14.5 billion), according to the International Trade Administration (ITA), a division of the U.S. Department of Commerce, using Census data from 2013. The ITA also indicates that exports were not predominantly the Big 3 automakers exporting finished products, but small producers of automotive parts. In 2011, 7,215 different businesses exported out of metropolitan region, with 90 percent of exports coming from firms employing fewer than 500 employees, according to the ITA. The next two maps look specifically at the Ports of Detroit (this includes two ports, Detroit Metropolitan Airport and the Port of Detroit – a container port). These maps show export partners by value and by weight for 2010, the last year for which the Census Bureau has port-specific data publicly available. When examined by value, Detroit sent a great deal of export value in 2014 ($USD) to Canada and Western Europe. No country outside these two regions received more than $25 million in exports from Detroit. Nations with robust automotive industries of their own – Germany, the United Kingdom and France – are among some of the largest recipients of Detroit products. When examined by weight, a more broad trade geography emerges. Including this measure allows us to see more clearly where finished vehicles and iron ores are going. While Canada, Germany and the United Kingdom still lead among export recipients when considered by weight, South Africa and China emerge as significant trade partners. The ITA indicates that since 2010 Michigan has seen a noteworthy increase in trade (by value) with Mexico, Saudi Arabia, China and the United Arab Emirates, which have overtaken many of the European nations to join Canada among the top five recipients of Detroit-area exports.